Star Wars: The Last Jedi – 4K Ultra HD Blu-ray review | What Hi-Fi? The surprisingly divisive The Last Jedi hits 4K Blu-ray, forging a(nother) new path for the Star Wars saga. After The Force Awakens rejuvenated interest in the Star Wars saga, attention turned to the next film in the series: The Last Jedi. Rian Johnson taking on directing duties from J.J. Abrams was an intriguing choice. Here was a writer/director with no big film experience, who has a knack for clever ideas and a flair for upending genre conventions. We had hoped that Episode VIII would be daring but, even so, no one expected The Last Jedi to be the polarising film it has become. The story picks up moments after the conclusion of The Force Awakens. The First Order is closing in on Resistance forces, with Rey’s plea to Luke Skywalker to end his self-imposed exile falling on deaf ears. With the battle for the galaxy teetering on a knife-edge, will Skywalker return and help fend off The First Order? For most people, Awakens was the Star Wars experience they had been waiting years for, a return to the simple good vs. evil dynamic of A New Hope. As a narrative, though, it could have been braver. That’s where The Last Jedi steps up to the plate. This is a film with a lot on its mind, the 2 ½ hour run-time a testament to how much ground it covers. It’s a film about hope and self-sacrifice, a story that functions as both an end and a new beginning. Johnson isn’t interested in scratching the surface, but in getting under the skin and exploring these characters, pushing them – and the audience – out of their comfort zones. That’s none more obvious than what it does with Luke Skywalker. Mark Hamill plays him as a forlorn, pragmatic character whose lost faith in himself and the usefulness of The Jedi Order. From a certain point of view his actions are logical, but it’s a drastic difference has upset fans and will continue to do so. It’s a change (sad as it is to see) that shakes up the series, taking it out of the familiar territory Awakens lodged itself into. This ethos allows the film to explore and expand the idea of a Star Wars film. There are new locations in Canto Bight (the Monte Carlo of this galaxy), new characters in Kelly Marie Tran’s Rose, Laura Dern’s Holdo and Benecio Del Toro’s DJ, in what’s fast becoming a more diverse series with each film. Domhnall Gleeson’s Hux is more than just the sneer in a long black coat he was in Awakens, and Carrie Fisher’s Leia looks more like the character we knew from the original films. It’s a shame we won’t see that character develop further in light of her passing. Andy Serkis’ Snoke makes more of an impact, but his character leaves us with more questions than answers. That sheer breadth and depth of what’s on offer does make for a film that’s unwieldy and overstuffed in places. The Canto Bight sequence is a nice respite, but feels isolated and doesn’t make great use of John Boyega’s charismatic Finn. Dialogue can be clunky – “we are the spark that'll light the fire that'll burn the First Order down” doesn’t roll off the tongue so much as land on the floor with a thud. The film is very earnest too and some moments, such as the ‘Mary Poppins’ scene, induce an eye-roll. But it’s easy to lose sight of what works. Adam Driver’s Kylo Ren is a fascinating antagonist, full of depth and complexity. The ‘force connections’ he has with Daisy Ridley’s Rey (another endearing performance) further deepen the relationship between the two. It’s a Star Wars film in look and feel but is made up of many influences, extending from Akira Kurosawa to World War II bomber planes. There are stunning images throughout the film, such as a moment near the end that’s almost entirely silent. The reappearance of an old favourite is sure to generate a smile and there's a lot of humour to leaven the film's more serious moments. And while the Canto Bight sequence is a little out of tune, the insights it offers are plenty interesting. The Last Jedi is potentially the most thoughtful, and certainly the most challenging, film in the series. It recognises the series’ history, but knows that in order to progress it needs (as Kylo puts it) to “let the past die”. The Last Jedi serves as a reflection on where the series is but doesn’t allow itself to wallow in its past. It stumbles, but in choosing the difficult path it has taken the series to new and interesting places. The Last Jedi was shot on 35mm, with some scenes using a mixture of IMAX cameras and Arri Alexas at 3.4 and 6.5k. It received a 4K digital intermediate that was used for this release. The disc sports both HDR10 and Dolby Vision HDR - we’ve looked at the former. The standard HDR treatment is fantastic, enlivening the film’s already colourful palette. It’s a brighter encoding, one that lends itself to revealing a better sense of detail in a way that makes you wonder why we even bother with HD. Scenes feel flush with more colour and tones – the moment where Luke boards the Falcon is awash with more vivid blues and reds of the assorted lights, and feels more accurate in terms of the hues of the colours. Complexions look better balanced, and there’s more fine detail to be gained and much firmer shadows too – Snoke’s horrific face is better etched in Ultra HD. Tones are much bolder and textures, whether they be clothes or surfaces, are given a better platform to shine. Scenes pop much more - such as the Battle of Crait, where you’re able to discern the various shadings of reds and whites to a much greater extent than is possible on Blu-ray. Contrast is much improved, with clouds punchier and better resolved in 4K. Intensity of colours, whether it’s a lightsaber or the red of Snoke’s gorgeous-looking throne room, have gone up a few notches - all of which helps to produce, a stronger, firmer image. It’s a fantastic-looking film and really ought to be seen in its 4K glory. 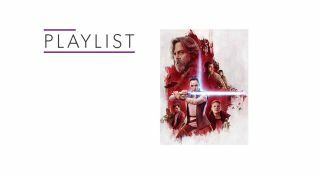 The Last Jedi is no letdown on the audio front either. With a Dolby Atmos track on board, it’s an excellent, dynamic effort that’s full of detail. Bass performance is more of a thud than room-shaking heft, but works well enough. Positioning is excellent and it’s easy to define where sounds are originating from. It’s capable of going loud but is even more impressive at the times it goes quiet, the soundtrack remaining still and focused. In such a musically driven series, John Williams’ fantastic score (again) helps propel the film, often utilised across the front speakers and given a little room in the height channels too. Atmos is used well, expanding the film’s soundfield with appropriate uses of the object-based format. There’s a lot of activity you may miss in the surrounds but are there, whether it’s little explosions happening in the backgrounds to the echoes in the ‘force connection’ conversations between Kylo and Rey. Dialogue tends to be centred but can often escape to the surrounds and is intelligible. The soundtrack as a whole is full of clarity, the soundstage and depth providing an excellent sense of space and detail. It offers a highly enjoyable performance. The Last Jedi wasn’t the film most thought it would be, but that’s no bad thing. It is most definitely a film sprung from Rian Johnson’s mind, one that grapples with legacy and doesn’t always work - but is much more interesting for taking a risk with the saga and its characters. In terms of visuals and sound it is a top performer, with a beautifully realised picture and engaging sound mix. The Last Jedi really warrants a 4K TV/projector with a surround package to get the best home theatre experience. The bigger the better. It has its flaws, but out of this and The Force Awakens, we’d watch The Last Jedi - it gets better and more interesting with every watch. You get three discs with the 4K release. One is the 4K disc, a blu-ray with HD version and then another Blu-ray holding the bonus content. We'd recommend watching the feature-length The Director and the Jedi piece. It's very illuminating, and the sort of feature that's become rare.